For months now, we've been hearing the economy is growing and getting in good shape. However, why don't I believe that? Perhaps, as a chartist, though I may not be up on all the latest news for everything, that may be a good thing. What do you think? As I've said in previous posts, price action has been marching up for weeks on the S&P 500 (SPX) while bullish volume has been decreasing. That's a divergence in the data. 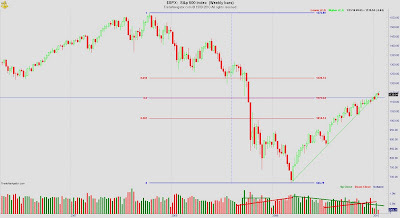 We are in the area of 50% retracement from the high of 1576 in Oct'07 and low of 666 in Mar'09. 50% retracement is 1121. Yes, we are slightly above that. Yes, there are other pausing points in between, but these are some key areas to look. I still hold to my hypothesis that 666 was not obtained by chance, rather that was a very deliberate point. Looking here at RSI & MACD, RSI is showing consolidation into a pennant. It's compressing. We can see earlier in late 2008 when price action was moving down, RSI began diverging from the price action, showing BULLISH divergence. Surely enough, we get the bounce off of 666. RSI has been in the same trend as price action, trending up. 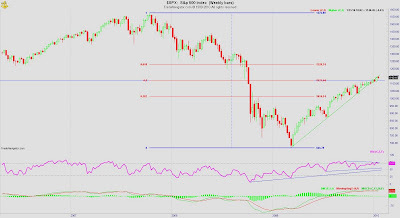 But, now we see some bearish divergence and the uptrend looks to be slowing down. 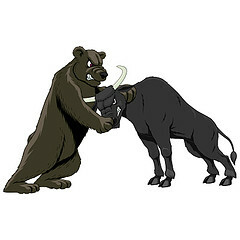 MACD is showing NO strength in either the bearish or bullish direction. Before the move down in 9/08, MACD showed similar as now. However, the period was way less. One of the things I learned from a prior trading coach is that the longer it stays in colsolidation, the less strong the breakout. As I am just guessing, if we push down to 666 somewhere soon, the amplitude from here to 666 is less than 1576 to 666. It's a challenge for me to believe we were only there for 2 weeks and less of a test for that area than I imagined. There is always the chance that I can be wrong. It's happened many times and will undoubtedly happen again. I wonder if the news is attempting to hype up that we are heading in a positive direction in the economy, when, in fact, it's about to go back down again for a bit. I probably should read some stuff on the housing market, banking. That might tell me some things. However, due to my busy schedule and not wanting to clutter my mind, I tend to be a bit lazy when it comes to reading news. It seems to sort of mess up my trading when I do.